First-half goals from Jamie Masson and Jordon Brown, a wonderful Daniel Park free-kick and late strikes from Hamish MacLeod and Ryan Ferguson helped the Blues ease to the last four. Cove striker Park, who capped a fine performance with a stunning set-piece goal, said: “I meant to put that free-kick more into the corner but luckily it went in. “It was a good team performance after our 1-0 defeat at Fraserburgh. Cove left skipper Eric Watson on the bench along with experienced defender Alan Redford but top goalscorer Mitch Megginson missed out with a calf strain. Huntly goalkeeper Euan Storrier felt unwell on his way to the game so goalkeeping coach John Farquhar was pressed into service. Striker Gary McGowan was suspended. Farquhar was immediately called into action and did well to block a Blair Yule effort with his legs and as the ball spun goalwards he reacted quickly to scramble it clear. Huntly had a great chance to open the scoring 60 seconds later but former Cove forward Nick Gray screwed his 10-yard drive wide of the post. Cove broke the deadlock in the 18th minute with Masson’s 25-yard free-kick deflecting off Cammy Booth in the Huntly defensive wall to wrong-foot Farquhar. Park came close to doubling the home side’s advantage but after skipping past Huntly captain Michael Clark he fired inches wide of the far post. But Cove made it 2-0 six minutes before the break when Jordon Brown had the simplest of tasks to nod home from Park’s inch-perfect cross. Farquhar again came to Huntly’s rescue to block a Park piledriver before Yule scraped the crossbar with a superb effort from the edge of the box just before half-time. With 20 minutes to go Cove central defender Darryn Kelly was forced off injured and replaced by Ryan Ferguson. In the 79th minute Cove were in cruise control when Park hammered a 22-yard free-kick high over Farquhar and into the roof of the net. Cove made 4-0 four minutes later when substitute Hamish MacLeod, who had only been on the pitch for two minutes, stroked the ball past Farquhar from eight yards before Ryan Ferguson rammed home number five in the final minute. 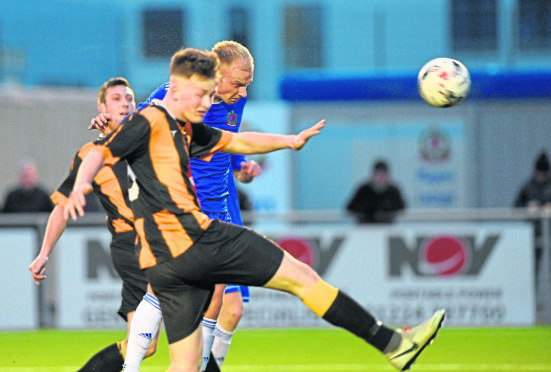 Huntly midfielder Paul Napier said: “It was like men against boys near the end.